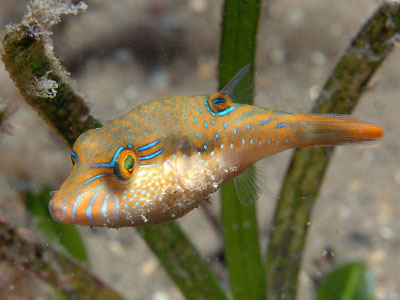 Bennett's Sharpnose Puffer is a puffer fish type that comes from the Tetraodontidae family. These fish varieties are native to the Fiji Islands and they belong to the Canthigaster group, and they are called as Tobies. In the wild, these fish varieties live in rubble zones and in open sand slopes situated in sheltered lagoons and reef flats. This detail sheds novel insight to the ostensibly decorative coloration and pattering of the fish. When developed in the aquarium, usually, these fish varieties prefer a tank with a minimum capacity of 50 gallons, with the temperature of the water, ranging from 72 degree Fahrenheit to 78 degree Fahrenheit. The Bennett's Sharpnose Puffer fish breed is a non-violent fish, attaining a maximum body length of 4 inches when matured. These fish have a sparkling orange colored body, with turquoise marks and bars, which create a good-humored pattern as though the confetti and streamers were spread across a field. Under this multicolored pattern, the body color is separated by a tempestuous, olive gray colored dorsal half and a lustrous white colored ventral half. The general effect is a lively coloration that suits the curious and amiable Bennett's Sharpnose Puffer. The cryptic bars and spots and the dark dorsal area matching a light ventral area of the Bennett's Sharpnose Puffer fish enables the fish to conceal it from its possible predators by disrupting the shape of its body. They prefer a well-planned aquarium, incorporated with live rock and rubble for trouble-free access to big open regions. These fish varieties may attempt to feed on invertebrates that can easily fit in their mouth. Usually, these aquarium-bred fish breeds, feed on their prey by making use of their fused teeth similar to a beak to squeeze open their prey. Bennett's Sharpnose Puffer fish breeds are Omnivores. When they kept in the aquarium, they are fed with a variety of vegetable matter and meaty foods, such as squid, clams, krill, and solid shelled shrimp.